Changing the conversation around diet is no easy feat. Our society is appearance-obsessed, always looking for the next quick fix, and constantly immersed in a toxic diet culture. Too many people fall prey to this system, but there’s a better, more-sustainable approach. For many of us, the solution to finding peace with food isn’t found in the newest diet book or achieving a certain number on the scale—it lies in our mindset. Health is a life-long journey, and a process that is meant to be enjoyed. 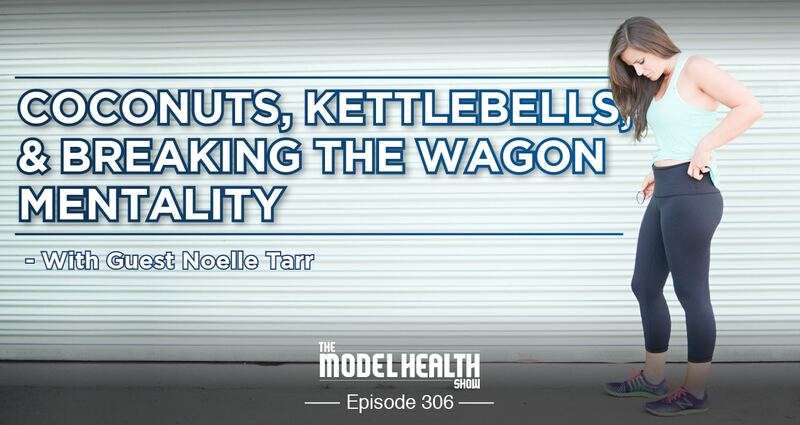 On today’s show, Noelle Tarr of Coconuts and Kettlebells is here to share her experience with overcoming diet culture and finding balance in a health-centered approach. Her story is full of insight about how to shift the paradigm around food and exercise, finding your worth, and what it truly means to be healthy. The importance of shifting your focus away from the number on the scale. Why the concept of “falling off the wagon” is toxic for our well-being. How to stop thinking of health as a destination. Why it’s so important to stop giving food morality. How health and fitness marketing often perpetuates a cycle of shame. The role of mental and emotional health in weight loss. What it means to set minimums for your macros. How to stop restricting and start creating a diet plan that works for you. The four foods that could potentially be problematic for your body. How undereating can stop you from reaching your goals. The importance of managing stress. How cortisol can contribute to weight gain and fat storage. Why evaluating calories in/calories doesn’t always work. Noelle’s three favorite recipes from her book. Listen, we've got a serious issue going on with our society right now. Most of the conversation around diet and nutrition is centered around weight. Most of the conversation is centered around our weight, when in reality our diet is supposed to do really two things. A, give your body the nutrition it needs to function at an optimal level. You know? Making sure that your brain is functioning properly, which is kind of recruiting about 25% of your caloric intake. Your liver, your pancreas, your kidneys, building your blood, all of that cool stuff. That would be kind of important, right? Nutrition should be talked about in that context of course, but that's not what the conversation is centered around. So that's A. And then A2, which is really because both of them are A, A2 would be to give us a sense of joy and pleasure through that diet format, you know? Through the food that we eat. That matters because food actually tastes good, it's an evolutionary thing in order to get us to eat the food, but as we've evolved we've had flavor components in food that will essentially indicate the nutrition that's found in it. And this is one of the things we've been talking about more and more on the show. So we get caught up in the diet conversation, and we get caught up in the idea that it's connected to weight and weight only. And this is a big issue and I'm really hoping to make this shift. And if there's a B I can throw in here, I would say that the diet conversation should be centered around eating things that- or avoiding eating things that are just not directly going to take us out. Right? And it's really that simple, you know? Eating food that's going to really deliver our body the optimal nutrition that we need, A. And then A2 is to be and experience of pleasure. And this is a big difference from the story that's promoted out there, you know? There's the sayings like, "If it tastes good, spit it out." Right? That's crazy. Crazy talk, right? And also this idea that healthy food can't be flavorful, healthy food can't be a joy to experience, and it's just not true. And our guest today is somebody who is really stepping to the forefront to help to make all of this make sense. This whole diet and nutrition paradigm shift taking place, and reorienting ourselves to not just looking at nutrition and diet as something that's going to help us lose weight. Which it can of course, but making it a bigger picture so that we can be the very best version of us, and that's what it's really all about. Now before we get to her, listen, I don't know about you, but when I was a kid, I remember my grandma, the first day she packed my lunch and added in this Capri Sun. Do you remember Capri Sun? Because it was like forget the juice box, right? We're going to put juice in a little bag, and we're going to make it so that when you're trying to put the straw in that little baggie, you're going to squirt out 25% more of that juice on you kids of America. So I had that experience with the Capri Sun, and the thing about the Capri Sun is that the flavor, there was something really special about it. It was like a little bit of unicorn milk in there or something. A little bit of like- do you remember in Cinderella, they had the pumpkin, and she turned it into like a carriage or something like that? But it was like a little bit of juice from that pumpkin. It was like a magic pumpkin in there. Right? It just tasted amazing, right? And little did I know that these were the things that were kind of setting my template, and my body, having these artificial flavors, were looking for certain nutrients and it just wasn't getting it, you know? So we're turning that whole paradigm on its head today by getting ourselves Organifi green juice and Organifi red juice. These two things provide real nutrition, but they actually taste good. So when patients were coming into my clinic for years, they would come in asking me, "Should I take a multi-vitamin? Should I do this? Should I do that?" And for the most part, I would really encourage people to avoid multi-vitamins because of the fact that they're generally from synthetic nutrients, and also the fillers, and the stabilizers, and all these things that we're finding more and more research indicating that some of those things could be dangerous for us. And so the reason that I love the green juice and the red juice, this is like what we were really looking for when we were kids, you know? To give us that delicious experience of having our little juice, but also providing a tremendous amount of nutrition in the same go, you know? So I'm a huge fan of the green juice, and one of the big components of this is spirulina. We've got research indicating that spirulina can do a process, or contribute to a process in your body called stem cell genesis, right? Stem cell genesis, creation of stem cells. Capri Sun I promise couldn't do that, alright? Hi-C and Tang could not do that, alright? But that's what you get in the green juice. The red juice, my son Braden who's six years old, his birthday is actually- when this comes out is probably on his birthday, so happy birthday, B. He's a big- he loves the red juice. It's his favorite. We were just sitting around one day, he was like, "You know what? I really like the red juice." So red juice contains acai, alright? Acai is hot right now, alright? It's hot on the streets. We've got pomegranate, we've got blueberry, we've got strawberry. Superfood real food concentrates, low-temperature processed to retain the nutrients. So it's not like baking, frying, dying these foods, and then calling them a multi-vitamin. This is the real deal, alright? So definitely get yourself, get your family on the green juice. If you haven't tried the red juice yet, highly recommend it. Head over, check them out, www.Organifi.com/model. That's www.Organifi.com/model and you get 20% off. Alright? 20% off. Head over there, check them out. Get off the Capri Sun, alright? No more juice in a bag, alright? Let's upgrade, alright? www.Organifi.com/model for 20% off. Now let's get to the iTunes review of the week. ITunes Review: Another five-star review titled, 'Realest Guy in the Room,' by BillNurse. "I've been listening to this podcast for a few years now and I can say it's one of the best out there. If there was one podcast everyone should listen to, it's this one. Shawn is so motivational and inspirational and is so good at what he does because it all comes from his heart. The guests he has on are all the best, and the knowledge he passes on is priceless. Keep up the good work, Shawn." Shawn Stevenson: That's what it's all about. Wow, thank you so much for leaving that review for me over in Apple Podcasts. I can't say enough, just thank you so much, that means the world to me. And everybody, if you've yet to do so, please pop over to Apple Podcasts and leave a review for the show. It means everything! Alright? I appreciate it so very much. And on that note, let's get to our special guest and topic of the day. Our guest today is Noelle Tarr, and she is a nutritional therapy practitioner, and an NSCA certified personal trainer. She's the owner and founder of the health and fitness blog, www.CoconutsAndKettlebells.com - such a cool name - and is the co-author of the book, 'Coconuts and Kettlebells,' which I have my hands on right here. A personalized four-week food and fitness plan for long-term health, happiness, and freedom. Noelle is also the voice behind the top-ranked fitness and nutrition podcast, The Well-Fed Woman Podcast, and is the creator of Strong From Home, an online fitness program. She lives in Fairfax, Virginia with her husband, one-year-old daughter, and two boxer dogs, and I'd like to welcome to The Model Health Show, Noelle Tarr. How are you doing today, Noelle? Noelle Tarr: Good, thanks for having me. Shawn Stevenson: Oh it's totally my pleasure. Very, very happy to have you on. Noelle Tarr: I'm excited to be here. This has been quite the experience already, seeing how you guys do your show and operate. Being a podcaster, I love kind of interacting with other podcasters, and it's a cool gig. Shawn Stevenson: Definitely, definitely. We're about that excellence. We're about excellence. So with that being said, where your career is right now, I'd love to hear your superhero origin story. Alright? What got you interested in health and fitness in the first place? Noelle Tarr: Yeah, goodness, it's a long story but I will keep it brief. I actually in- when I was in high school and in college, I really fell in love with the sport of triathlon, and I loved doing triathlons, and I loved running. And it was originally something I did to really start working out, starting getting into fitness, doing all the things that I felt like I should be doing. 'Should' be doing. And with that came trying to restrict my calories, and trying to eat healthy. And at the time, I'm sure you remember, this was maybe fifteen years ago, it was about eating low fat. Noelle Tarr: And so I really did eat pretty low fat, I was a vegetarian, and so I thought I was checking all the boxes and doing everything correctly, I was doing everything right. And I was pretty invincible, you know, you are when you're in high school and college, and I continued to up my training, and continued to really be hyper restrictive of my food. And at some point, that really stopped working for me. You know, I sustained a really severe injury around- that I had basically from doing too much training, and not supporting my body with nutrition, and that was after college, and I had to really check myself. I had to really say, "What am I doing? What am I doing this for?" And if I looked back, I could kind of see there was this cycle that was happening which was I felt guilt, or I felt shame, or I felt like I needed to be something, I needed to look a specific way. I really wrapped my worth into what I was eating, and how much I was working out, and my performance. What were my times? What were my mile times? What was my marathon time? And looking back on that, after I got out of college, it was kind of like I saw this cycle happening of feeling guilt, or not feeling good about myself, or feeling like I had been bad, you know? I'd eaten sugar or something. And then trying to 'remedy' that with working out more, and restricting my calories more, and trying to really stay on the wagon, and really trying to- the next health book would come out, and I would say, "Oh, that's the answer," so then I would do that. And so it was just this constant cycle of trying all these diets, trying all these new fitness programs. CrossFit came out and was pretty big in about 2007-2008, and I started getting more involved with that. And that's where I really had a shift in my journey. It was less about how little could I eat, and how much could I train, and it was more about quality. And so I started following more of a Paleo approach, and that- even though it was still something I did as the next diet to try to get me lean, and fit, and help all my dreams to come true, in essence it taught me and it allowed me to not be so focused on the number of calories that I was eating. And so it was more about how much food- like what are the nutrients that I can get in? And so that was really the shift for me, and around that time, I decided, "I want to start helping people." Because I feel like I started looking around, and I started seeing a lot of women stuck in the same cycle that I was, and so I kind of had a huge shift. And I was in marketing, I was working for a triathlon company, I was working in the running industry, and so I was like in it, and I wanted out. So that's when I started pursuing an education in nutrition, it's when I got my personal training certification, and I started being more open and honest about my experience, and writing- started my blog, started the podcast, and I think that a lot of women were craving the message of, "Your worth is not in your food and your fitness. You don't have to be chasing a weight that you were in high school." Like let's shift our mentality, let's shift our mindset to pursuing health, and longevity, and being there for our family. And you know, what do we want to be when we're sixty years old? And so that's kind of been a really awesome journey in these past five to seven years, is really helping people and seeing that shift happen more so in the diet- or the health and fitness realm. Shawn Stevenson: Awesome. Awesome, thank you for sharing that. And I just- the reason we talked about this before the show, but I really appreciate the way that you're going about this, and I think it's so important and such an important message right now. But the thing is, as you know, a lot of this- even though the idea that you're sharing is right on the money, it can be easier said than done, when kind of breaking the cycle. So let's talk a little bit about some of these things that you've kind of brought to the forefront. Let's talk about what is the wagon mentality? Noelle Tarr: So this is one of my biggest pet peeves, especially working with clients, and we have in our culture- we have this idea that there is a wagon, and when you were doing all of the right things, you're eating all the right foods, you're in the gym every day, you're on that wagon, and you're cruising. And it's almost like, "I've achieved health. Here I am. I'm doing the health thing." And when a party happens, or a baby shower, or a Christmas party, or whatever, we eat a cookie- or we go out to dinner, something very normal. We go out to dinner and we eat a cookie, or we have a dessert, all of a sudden we have fallen off the wagon and we are no longer pursuing health. We are no longer healthy, we're no longer at that healthy destination. And so for a lot of women and men, that means just tumbling. And not just falling out of the wagon, but just going off of the side of the hill, and eating your way through a whole jar of cookie dough, or just going nuts, and staying out of the gym for a few days. And it is really that mentality that makes it so hard to have a sustainable healthful lifestyle. So if you think about it, considering when you're eating healthy things, and you're doing healthy things, if you think about it as, "Well now I'm on the wagon, and I'm doing the things, and I can't get out of the wagon," you're just asking for it. You're asking for- because inevitably you will fall out of the wagon. Life happens, something will come up, and so you are going to eat a cookie, you are going to eat something that's not 'good' or part of your health plan, and when that happens, typically our response is to feel guilt or shame and to try to remedy that guilt and shame. Guilt and shame is really not fun, you know? It doesn't feel good, we don't want to feel it, and marketers know that, and so a lot of diet programs, and products, they go straight for it. They make you feel shame or guilt about the way that you look, or some way that you're eating, and the best way to remedy that is to either jump on another diet plan to make those rules stricter, to work out an extra hour, to fast in the morning, and that just really leads to- that just perpetuates the cycle. We're just on the wagon again, you know? We're on the wagon, we see health as a destination, and health is not a destination. Right? It's a journey. And so if we see life and health as a journey, and something that will ebb and flow, and something that needs to be flexible in our lives, because life is flexible, things happen. You know? Our bodies fluctuate. And if we see it as that, when we eat a cookie, we can just revert back to whatever we were doing before and it's not that big of a deal, and that in essence is a sustainable plan. That is how health has to happen, because I think that the thing that's missing most in our society, and this is what you've touched on, is your mental and emotional health is like just as important as your physical health because it directly impacts your physical health. So if you have fallen off the wagon per se, and you've eaten a cookie, and you feel this shame and this guilt, and you're beating yourself up for it, like that's not healthy either. Noelle Tarr: And so many cycles of that, then you just feel like a really crappy human being, and you're down on yourself, and that doesn't lead to health either. And so if we can change our mindset around food and see it as neutral, all food is available to you, and you can engage with food that's not so healthful, and that's okay. That all of a sudden doesn't make you unhealthy, right? You are a healthful human being. You can eat a cookie and then go right back to what you were doing, and that's not really going to impact you over the long-term. Shawn Stevenson: Wow, that's so powerful. So, so powerful. Thank you for sharing that. And listen, if everybody wants to picture right now, picture yourself riding in the back of a wagon right now. You're sitting on the side of a wagon, maybe you've got some other people in there, maybe picture the cast from Little House on the Prairie. Right? Michael Landon's in there with you. Shawn Stevenson: But you're in the wagon, and somebody passes you a cookie. You eat the cookie, you're like, "Oh well." Boom, you jump out the back and you go stumbling, falling around. Like you ate the cookie, and then you stay there, right? As she said, you're rolling down the hill until you see another wagon come along. Not even the one you were on. Then you grab on, you get your Jackie Chan on, and you grab onto that wagon, sling yourself into this wagon, same thing. You're chilling in the wagon, you're eating some keto, you're eating some avocado, all good. Somebody passes you a slice of pizza. "Well, see you guys later." Boom, you jump out the back of that wagon, you know? That's really how we're living our life, and you just really brought that in such an interesting way for us to see this in another light because that's literally what we do. And what we need to do is to get out of this wagon mentality and to know that it's okay. It's okay. That cookie is not- it's not your ejection button from the wagon or whatever, you know? And I think it's so healing to even hear something like that, and to get it kind of in our conscious awareness, because it's something that's going on in the background. And I want to talk about something you mentioned as well, and it's so important. You said the word 'shame,' and this is something that you kind of detail in the book as well, that there's a cycle. Right? The shame cycle. Can you talk a little bit about that? Noelle Tarr: Yeah. Shame is everywhere. It is really pervasive, as I mentioned before, in marketing of diet programs, and 21-Day Fix Yourselves things, and flat bellies in seven days, whatever it is. Basically what is being projected to us is that the way you look, a certain feature about your body, the way you're eating, the way you're doing fitness isn't the way that you should look, or isn't the way that you should be pursuing fitness. And because you're not doing that, you should feel shame about that. There's something wrong with you. You're a bad person. You're not worthy. Shawn Stevenson: The snapback. The snapback. Noelle Tarr: Yes, and get rid of your cellulite, get rid of your stretch marks. We've been told over and over again that these things are bad or wrong to have, when in essence they are not. And so when we feel really bad about that, and we feel the shame, we desperately want to get rid of it. And so the way to get rid of it is to either- usually it's one of three things. It's beating ourselves up, so just harsh self-talk. It's bringing in the restraints again on our food. So, "Gosh, I have cellulite, I look terrible." Or, "I ate that cookie," or whatever. "I need to just- I'm just going to stop eating all desserts." Or, "I'm just going to fast in the morning." Or it's - which I used to do a lot - which is, "Well I need to work out extra tomorrow. Instead of running five miles, I'm going to try for seven or ten." And so in essence the shame cycle is this idea where we have decided that something about us is wrong, or we're doing something 'wrong,' or we are bad, and so we need to restrict something. And the example in the book is hamburgers, you know? It's like, "Okay well Paleo says I shouldn't be eating hamburgers, so I'm just not going to eat any hamburgers. Hamburgers are bad. They're bad. They're morally bad, and I'm not going to eat them." And so the more you try to restrict something, the more you push something away that you have decided is bad, then you kind of always- you think about it all the time. It's just always on your mind because you've given it more power. You've essentially given it more space in your mind because you're trying to restrict it because you've decided that it's bad. And so when eventually you will, as we've talked about this with the wagon mentality, when you eventually do eat a hamburger, it's sort of like you feel shame and guilt because now you're a bad person because you've engaged with hamburgers. And to remedy that shame and guilt, we say, "Oh, now we're not going to eat hamburgers and fries." Or, "Oh, we're going to work out extra." And we do the same thing that got us in the situation in the beginning. And so it's just this constant cycle, and so many women and men go through it on a day-to-day basis. And I think that the- really where it starts is giving morality to food, where we decide that food is either good or bad, and how we engage with it makes us a good or bad person. So our worth, our morality rests on whether we engage with a good or a bad food, and where these labels came from is the real problem. It comes from these kind of extreme one size fits all diet plans that says whatever, all of a sudden pineapple is bad. Or there was a phase for a while where liquid smoothies are bad, any sort of liquid food is bad. And I had to like work with clients on that because they were like, "I love smoothies, but I know they're bad." And I'm like, "Hold on, wait a second." So it's whatever somebody says is bad, and so we have decided that we are a bad person when we engage with that. And so it really starts with saying, "Look, food doesn't have morality. Your morality is not reliant on whether or not you engage with certain foods or not." Your worth is not reliant on that, and we have to see food as neutral. And yes absolutely, certain foods are more nourishing than others. There are foods that are going to serve your body better than others, but you're not a bad person if you engage with non-nourishing foods. Shawn Stevenson: Yeah. Oh man, I mean there are so many powerful insights there, and I hope everybody- that's something to go back and listen to again. That's incredibly powerful. One of the big things that you mentioned was this idea of if there's a food that we project or have this reality or paradigm in our mind that it's bad. And by the way, when I gave the example of the wagon and somebody passes somebody a pizza, this could be you're on a Paleo diet, and somebody passes you some beans and rice, right? It could be just something that you consider is a bad food, or something that you don't eat. But here's the issue psychologically; if you actually really want that food, and you create this construct in your mind where it's bad, it's just going to kind of haunt you. You know? And at some point, if you're just like, "Pasta is bad. Like pasta is the worst thing ever invented," you're going to find yourself- you're going to be in Italy one day. Like it's going to be a destination wedding, right? Everybody's like having pasta, and wine, and you're just going to look at that pasta, and you're going to lose it. You're going to go neck deep, you're going to go balls to the walls in pasta because you're going to be like- humans want to be free. We don't want restrictions, and the word diet itself indicates this ideal of deprivation, restriction, not enough, and it's just not healthy, and it doesn't align with our basic human psyche. And so, so many powerful insights there. That's really powerful. And also the concept of those three different things, and especially that last one, of trying to outrun the food. Right? "I'm going to run this cake off that I ate yesterday, or this pizza, or the sweet potatoes." You know? If you're not supposed to have sweet potatoes because you're doing the Keto Diet, "I'm going to hit those seven today instead of five." It's virtually impossible to outrun our diet, you know? Like you can guzzle down 1,000 calories in like thirty seconds for real, and then it's going to take you two hours trying to work that off. Like two hours of like pretty high intensity exercise. It's never going to match up, and thank you so much for bringing these points up. I want to shift gears a little bit and talk about these macronutrients because we've kind of touched on- we've mentioned it a little bit. We've talked a little bit about carbs are in there, and our concept of carbs, and our concept of fat, and you were on a low-fat diet. I was on the low-fat heavy. Like low-fat cheese, alright? Noelle Tarr: I was doing fat-free cream cheese, so yeah. Shawn Stevenson: Oh fat-free, I did the fat-free, too. Man, we might as well just like punched ourselves in the mouth. Like just grab your tongue and just punch your tongue repeatedly. So let's talk about macronutrients, and what we really want to do and what you talk about is eating enough of these macronutrients. Instead of looking at these maximums, but minimums in order to support our body and our health. Noelle Tarr: Yeah, so it is no secret, what's popular right now is counting your macronutrients, restricting a certain macronutrient. For a while it was restricting fat, now it's definitely shifted to restricting carbohydrates. Not to say that low carbohydrate diets are not nourishing and not healthy, but you can also eat sufficient carbohydrate, and that can also be healthy. So in the book, we shift everybody's mentality a little bit and flip the script. We say instead of setting all these limits, which can kind of get in your head like we talked about before, and really kind of screw up your mindset around food, what if we give people minimums to reach. So instead of starting with zero, zero, zero, we start with fifty grams of fat, 100 grams of carbohydrate, and fifty grams of protein. That's your new zero. And so once you get to that, then you get to decide based on what works for you, your genetics, what you've tried and tested before, and we do give insight into that in the book, your health conditions, then you get to decide how much of each macronutrient do I want to eat? What do I want to raise and what do I want to only raise a little bit? So in other words, maybe I want to eat 100 more grams of carbohydrate, and only fifty more grams of fat. And so we really teach people how to get out of that restrictive mentality, and then create a plan that is right for you. And I will say the basis- the number one thing, the basis for this is first identifying what food quality really means. And I think that that is what- that's what the Paleo movement has done really well, is teaching people about quality, and teaching people about what it means to look at really healthy and nourishing fruits and vegetables and meat, and what is a quality carbohydrate? A candy bar is not the same as a sweet potato, right? And so once we teach people that, and we really focus on food quality, then we say, "Let's look at some potentially problematic foods." I think you and I both know that there are some foods out there that can really cause issues for people. Gluten, refined sugars, vegetable oils. We talk about those. Dairy is the other one. There's four of them that we really address, and so once we address those and say, "Look, these can be causing problems. We really want you to test that out and see which if any are causing problems for you." Then we move forward with, "Alright now let's eat in a way that's right for you." You don't have to follow some one size fits all plan that is all about taking all these foods out, or restricting your macronutrients severely. It's about let me eat to my minimums and experiment. Like figure out what works for me, and understanding that that may fluctuate. Some people say, "Well what if I do it wrong? What if I find that a higher fat approach doesn't work for me anymore?" Then you get to switch it, you know? I think so many people get stuck in the mindset of, "Well I'm eating low carbohydrate, and that's what works for me, and if it stops working for me, then I just need to like-"
Shawn Stevenson: Do it harder. Noelle Tarr: Do it harder. "It's my fault." And it's not, you know? Like your life fluctuates, like stress levels fluctuate. For women, our hormones fluctuate, and we may have times in our life where we need to switch to a more higher carbohydrate diet. And with the understanding that quality does matter. Of course no, you're not a bad person if you don't eat perfectly quality carbohydrate all the time, but I think you'll find that your body can exist in a very healthful state, both at a lower carbohydrate diet and a more carbohydrate. We call it a more carbohydrate diet, and it really all depends on what works for you and your physiology and your health conditions. Shawn Stevenson: Right, and even that can change. You know? Shawn Stevenson: And just having permission to adapt and adjust as things change. Your nutrition needs can literally change tomorrow, you know? As far as your energy intake and also the nutrients your body might need for maybe repairing something with some neuro tissue, or with your meniscus, or who knows? We have to pay attention to that and give ourselves permission to go outside of a typical diet framework, and I think that's why it's so important, and with your book, in providing folks with the most important tenets, and giving some structure that they can abide by but then find some flexibility in that to really create the nutrition that's right for you today, which again, will probably change. Same thing with sleep, you know? Like if we're going by this cookie- "I've got to get my seven hours each day," and then you start like your old reality, training for a triathlon, and you're like forty-five, and you're just exhausted now. It's just like you just needed a couple more hours of sleep, but you're going by this framework of like, "I always get seven hours of sleep, and that's what my body runs on." Not necessarily. We have to be willing to adjust. So man, that's so, so good. Alright so one of the things that you mentioned, more carbohydrate diet, and by the way, just as a clinician and doing work, I've seen great, great results with folks doing low carb, ketogenic. I've been teaching this stuff for over a decade, but at the same time, again having the flexibility to know what's right for that person. And you say in the book- you've even got a little section that says carbs are your friends, you know? So let's talk a little bit about why you say that, and which again, there's a big paradigm with keto. A lot of folks listening right now are doing keto and they're loving it, so why do you say carbs are your friend? Can be your friend. Noelle Tarr: Man, they can be your friend, absolutely. So I think that kind of touching on what I said before, and running this to the ground, quality matters. Quality matters, and I think a lot of- one of the things that we do address in the book is there's a lot of science around, "Well look at all of this wonderful stuff that a low carbohydrate diet does." But at the same token, there's a lot of science that shows, "Look at all the stuff that a vegetarian diet- look at all the positive things from a vegetarian diet." "Look at all the positive things from a low fat diet." And one of the things that is not in all of these studies is a real focus on quality. And I think that when we have that as our baseline, when we have sweet potatoes, potatoes- I love to soak and sprout my rice. When we're talking about like really quality carbohydrates, I think that we'll see that our body responds much different to those than it does a candy bar. This is exactly the same way when we talk about trans fats versus healthful saturated fats like coconut oil, and butter, and stuff like that. There's a completely different story there. And so first and foremost, we're talking about quality. Second, the body can operate really well on carbohydrate, just like it can work well on ketones. And when we, again, focus on quality and we're providing our body with sufficient fat and protein, and we're experimenting, and again, shifting. Like I think that the thing with carbohydrate intake is it could be 350 grams or it could be 200 grams, and that's a huge variation there. And so I think when we allow ourselves to experiment with macronutrient ratios and exactly how many carbohydrates we're eating, I think that we can find that there's like a sweet spot for a lot of people. And just as an example for myself in particular, I used to follow a much more higher fat approach, and then I had a kid, and then I was breastfeeding, and then I was very active, and it was like I was drained. I was not doing really that well, and I started just feeling a lot more comfortable with, "Alright, I'm just going to up my carbohydrate intake." And I shifted a lot of stuff in, including rice which I wasn't doing a ton of grain before. But I do rice, I do a lot of potatoes, and I just recently had a lot of bloodwork done, and my fasting insulin and fasting glucose, all that is fantastic. And that was real validation to me, and I know you've seen this with clients, and so have I, it's understanding that quality matters, that you can definitely have phases in your life where you can shift more carbohydrate in, really making sure that it matches your overall energy expenditure. So how much you are working out, or how much you're chasing your kids, and really making sure that you're assessing how you feel. So one of the reasons that we do say- so we make recommendations to show people, "Hey, this is how to know whether you might want to start eating more carbohydrate," and one of those is sleep issues. Another one is amenorrhea, which we have a lot of women struggle with that, and it's really the result of women eating too little and/or too low carbohydrate. And so supplying your body with carbohydrate, supplying your body with sufficient calories does allow your body to know that it's safe, that it can produce hormone effectively. It's not going to be in a chronically stressed out state, and we have a lot of women, when we say, "It's okay to eat carbohydrate, just eat more of it and see how your body does," then they get their period back. And so that's kind of been our experience. Now again, a lot of our community is women who have been- have a history similar to mine where they've just kind of tried every diet under the sun, and now they're really trying to restrict a lot of stuff. And so lifting those barriers and saying, "Carbohydrate is okay, it can be a healthful part of your diet," allows their body to finally function appropriately again. Shawn Stevenson: Absolutely. Yeah, I want to talk a little bit about- because it is a part of the conversation for sure with diet and nutrition, the whole concept of weight loss and weight gain. I want to talk about that. Just today when I was getting ready to head out and come to the studio, I went into my cabinet- because I use coconut oil for everything. It's like there's some memes about it. Like I've got ninety-nine problems, and coconut oil cured ninety-eight of them. You know what I'm saying? Shawn Stevenson: And so for cooking, and for your skin, and all that good stuff. And I did a show, by the way, I'll put that in the show notes, alright? With twenty different ways to use coconut oil healthfully, and of course I provided some really crazy research on it as well. But I have this huge mega tub of virgin organic coconut oil that I got from Thrive Market. And if I was to buy that same humongous container of coconut oil that lasts us so long for all the uses we use for it, I would have paid probably $20 more if I was to get it from a place which I love, like Whole Foods. And so Thrive Market is a big part of our lives. We save 25% to 50% off of the retail prices that you would find in great stores like Whole Foods, mom and pop nutrition stores, but why not save some money? Like we've got stuff to do, you know? Maybe you've had your eye on that Gucci bag. I don't know what it is. You can funnel some of that money over, or if it's just like paying for school supplies or whatever, like that's one of the big barriers of entry for people with eating healthfully a lot of times. Like, "Oh it's more expensive." You know? But you use Thrive Market as well, right? Noelle Tarr: I do. I actually buy everything from diapers on Thrive Market, my diaper cream, like everything that I use for my daughter, I get on Thrive Market. And then my whole pantry is stocked with Simple Mills, and siete chips, and I mean- yeah, I'm pretty much doing an order every week now. Shawn Stevenson: That is incredible. And then I love how they show you your savings, right? Noelle Tarr: Oh it's- yeah, it's great. Shawn Stevenson: It's bananas, right? Shawn Stevenson: Like literally when I first started- and we were the first podcast to actually feature Thrive Market, because when I found out about it, I was like, "Listen guys, I want my people to know about this." Because I really couldn't believe it. I was like, "How did you make this work?" And they're going right to the companies, and they're curating the very best companies, and putting this all together. So whatever your subscribed to right now whether it's gluten-free, Paleo, Keto, vegetarian, they've categorized these things for easy shopping. And we get stuff for our kids, as she mentioned, personal care products, household cleaning items, laundry detergent, all this stuff and we save, without all the toxins. And you know, if we're looking for organic and all this good stuff, fair trade, whatever it is that makes you feel good about your purchase, you can find at Thrive Market. So head over, check them out right now. It's www.ThriveMarket.com/modelhealth. That's www.ThriveMarket.com/modelhealth, and not only do you get 25% to 50% already, you get an additional 25% off your first purchase, and free shipping. Which that could be the deal breaker sometimes, you know? Like I've bought like $200 worth of stuff, maybe it was like www.FinishLine.com, maybe buying my kids some shoes or something, and then it's like $20 for shipping. No, I'll just go to the store. Right? So you get free shipping, and you also get a free thirty-day membership, and you're going to want to keep that membership because it's just going to keep- as she mentioned. When you're buying stuff all the time, and saving money, it's just going to keep giving more and more back to you. So head over, check them out, www.ThriveMarket.com/modelhealth together as one word. So now I want to talk about this phenomenon, which I saw this in my clinic and I know you've seen this. We'll say somebody comes in, and they've been- like they've been doing everything 'right.' Right? They've been working out six times a week, they're doing a dramatically calorie restricted diet. Maybe their goal- they've achieved their goal to a substantial degree, maybe they were 160 pounds, now they're 120 pounds or they were. Alright? They made it to 120 pounds, and they continued that same thing doing that six workouts a week, calorie restricted eating maybe 1,200 calories a day, and now they're starting to gain weight. Right? They've put on ten, maybe fifteen pounds over the last six months, and they can't seem to find out what's wrong. They're working out harder, they're being even more meticulous about their diet. You would encourage your clients to eat more. You would encourage them to maybe bump it up to 2,000 a day. And what would happen a lot of times is people would end up losing weight. So can you talk about how that's even possible? Noelle Tarr: This is my story, plus this is probably the story of so many of my clients, and I'm sure you've seen this. This is just so popular and it's because- well, for many reasons. So I think that what first and foremost the problem is, there's an underlying problem here, which is women and men think that they need to exist in a certain size because that was the size they were in high school, or their first year in college. And so they get so focused on this weight, this number, and so the number, that weight becomes the end-all, be-all instead of saying, "Well I'm just going to pursue health, and yes I'm hoping that weight loss is going to be a byproduct of that," which it usually is if you haven't been following a healthy lifestyle and then you shift into that. They get really focused on a number, and they let the scale define their success. And so sometimes with clients, I've found that they do really unhealthy things. They end up eating way too little, or they end up working out through really stressful times or injuries. And so yes, they get down to that number, they get down to that weight, but it's actually not a weight that their body- that's a healthy set point for their body. And even though they used to be that when they were eighteen, which is when you were a child and you're invincible, your body's been through a lot. You're an adult now, and so that 120 pounds, 115 pounds, which is a number we get so focused on, doesn't really mean anything other than it's a number that you've gotten fixated on. And so a lot of people sacrifice their health to get to a specific weight. And that was me, that's a lot of women, they end up eating too little, working out way too much. They finally get to that number but they can't maintain it because their body is under chronic stress. They are eating too little, they're working out too much, and the body is responding appropriately. Our body is magnificent. It wants to keep us alive, and so in order to do that, our metabolism is down-regulated, our thyroid starts to not operate appropriately, and chronic cortisol is really- I'm thinking of a bad word, but it's really mean. It's not good to our body. And so when we experience chronic cortisol, it really disrupts our entire endocrine system. And when we're talking about the female body, the female body really does like to have some extra fat on it, it likes to have stores, it likes to have energy because we're producing other humans, and that's kind of a big deal. So you know, that's- and the female body will quickly shift into supporting the stress response, and remove all of the things from supporting any sort of proper hormonal function. And so when people finally get to their goal weight, and they're there, and they try to keep everything going, and they're trying to keep running on that hamster wheel, essentially what they're doing is just keeping their body in a chronically stressed out state. Typically there's some mental and emotional stressors there as well, and that plays into everything. And so under-eating, you just can't under-estimate the effects of under-eating on your body. And oftentimes, when you start eating more, your metabolism starts to ramp up again, your thyroid starts to operate optimally. It starts to function appropriately. And your body starts to understand, "Oh I'm not running away from a tiger, I'm not about to die, there's not a famine." And so then your body can operate and function appropriately, and therefore your physiology starts to come back into balance, things start to work correctly again, and not only- let's not even talk about weight, you start to feel better. You know? You don't have fatigue, you can sleep better, all those things. And so I think that the two things here is sometimes- at some point, it really is about thinking that we need to exist at a specific weight to be healthy, and health can be achieved at a variety of weights. And oftentimes- 100% of the time when we pursue health, our weight is going- our body is going to come back into balance, and our weight is going to exist exactly where it needs to exist to be healthy. Shawn Stevenson: I love that. So I know some people are probably thinking, "But don't I need a calorie deficit in order to lose weight?" Yeah, there are some aspects of that, but this is very- I think it's kind of archaic science in just thinking that the calorie deficit results in weight loss. What about the whole other part of the equation where your metabolic rate can actually increase? Your body can actually start burning more calories when you are at a better state of health, for example. Maybe you have more muscle on your frame, and your body is able to maintain that muscle because it's getting properly nourished, and now you're actually burning more calories. You're eating more calories, but you're burning more calories. These are basic things that- in my nutrition class in college, like I wasn't taught that. I was just taught eat less calories, exercise more, basically if somebody wants to lose weight. That's definitely not the end of the equation because you can't take hormones out of the equation because in regard to weight loss and fat loss, it's really about what your hormones are doing. So we need to have more of a hormone focus, which is what you talk about in the book, than we do on this kind of obsession with calories. Right? Noelle Tarr: Yeah. I always- and this isn't the sexiest of topics, but it's like what are you doing to manage your stress? You know? That's my first point with most people is, "Let's talk about the stress in your life." Not just from whatever- your family, and the stuff you're managing at home, but what's your mental and emotional state like, and how are you eating in a way that could potentially- and doing the fitness thing in a way that may be teaching your body that it's under stress, and it may just be adding more fuel to the flame. And that's really hard for people. People don't want to manage their stress. They don't want to sleep more, and they want the easy thing, the easy equation. To me - and this may sound a little eh - but like I think that's the easy way out, just to say, "Oh it's all about calories in, calories out." And honestly, that's what a lot of health experts say, you know? Because it's easy. It's a clear science thing, and the reality of it is it doesn't work for many people, or it doesn't work for very long. Shawn Stevenson: You know, I believe that, and I think that's for certain people at certain times. I also believe that a lot of folks want to work harder. They feel that they can't get the result, they can't have the body they want if they're not working harder. And so having the concept that, for example, sleep influences your body composition, they're like, "Well I'm not really doing anything. Like I should hit the gym more, or cut away an hour of sleep, let me get to the gym or focus more on the diet so I can really try hard so I can get this result." You know, it's really kind of ingrained into our mind that this has to be hard. And so some people buy into that like, "I just want to work harder," and you can work yourself right into- you can work yourself right out of shape, if that makes sense. Shawn Stevenson: And so we're kind of getting people to pay more attention to not just working out, but working in, and also shifting our relationship in how we're viewing our food, and not just coming in like, "Okay, I've got to create this calorie deficit, and that's going to be the end-all, be-all." We have to have some intelligence. We have to cultivate an intelligence within our body to listen to our body and listen to that innate feedback on what you really need. And so this is a good segue to talk about your new book. First of all, I would love for you to share- your new book 'Coconuts and Kettlebells,' right? I would love for you to share what this book means to you personally, and why you decided to put this particular book out right now. Noelle Tarr: Yeah. So when I started the blog and doing all the things about five years ago, it really- I was trying to write nutrition stuff, and doing recipes, and while that's all fun and there's plenty of people also doing that, what really seemed to be resonating with people was this discussion around mindset, and understanding that you don't- like you don't have to be pursuing six-pack abs to be worthy and to be fit and healthy and to enjoy your life. And I wanted to do more of that, so I started a podcast with my co-host who also co-authored the book, her name is Stefani Ruper, and we both have a very similar mentality around health, and really desiring to help women. So we started the podcast and as we did more and more episodes, and the questions started pouring in, we realized that the podcast is great, and we love helping people, but we wanted to do something in a greater capacity. We wanted to help women, and give something that they could have in their hands, that they could give to their friend and say, "I think that you'll really love this. I think that this will really help." And so as you know, it's hard writing a book because you want to put everything in there, and you're also working with other people who are usually helping you, or publishing the book. And you know, weight loss sells, and so does one size fits all plans, and easy calories in, calories out. That sells, and we knew we were kind of trying to do something different in telling women they didn't have to lose weight, you know? They didn't need to be focused on weight loss. They could pursue health and do so in a way that works for them. And we just felt like since it was resonating so much with people on the podcast that we really wanted to just push for that. And so I'm really happy with how it turned out. To me, I mean it really feels like five years of my work in a book because it's not just, "Oh well do what works for you." We came up with some really concrete information, and like you said, of brain work for people to go off of, but we also were really specific in a lot of the whole mindset chapter. We talk about the wagon, we talk about morality, we talk about the fact that you don't have to be so focused on weight loss. That's not where your worth lies, is in the size of your pants. Like that's not a thing. That's what diet culture wants us to pursue, but you don't have to do that. And so really trying to get women to see health differently, and try to save them before they get caught up in the way that I did in the years that I feel I sort of spent so much time and effort pursuing leanness, and pursuing six-pack abs, and being so focused on that. I really feel it's interesting to look back. I'm like, "I could have been doing a lot more good." You know? I could have been doing a lot of other things in my life, and I was just so focused on this. And so my whole goal is to just save women before they get into that spiral, and really teach them how to create a sustainable plan so that they can do really cool things in their life. They can focus on what- all the things that their body does, not the way that it is shaped, or the exact weight that it is, because I think that's the end goal. Shawn Stevenson: Awesome. Awesome, so can you give everybody just a quick overview of what they can expect in the book? It says here you've got personalized four-week food and fitness plan for long-term health, happiness, and freedom. So can you just take us through? You've got this section, you've got that section, there's recipes. Noelle Tarr: There's lots of sections. Noelle Tarr: Yeah, there's a lot there. And that was the goal, was like one stop shop. You know, a lot of what I've said here is what is kind of the process for the book. So we start with talking about food quality. We start with talking about macronutrient ratios, and setting those minimums, teaching people how to set those minimums. And we teach people about potentially problematic foods, and I have a whole program called the Four By Four, which just is a basic approach for removing those foods, and then introducing them back into your diet in a very intentional way. And once you kind of have that all figured out, I have written up some meal plans. One is for butter lovers, so people who like and enjoy eating more fat, but also do and feel better eating a higher fat diet. And then one for bread lovers, which is just a cute name to say more carbohydrates. And so we have two different meal plans, I have seventy-five simple and easy recipes. It's stuff that is very easy for families to whip up, and make. And then my favorite part is the fitness chapter. I really do- I have a passion and a love for kettlebell, I have a passion and a love for home workouts, and making fitness accessible. And so along with the plan there is a whole section on fitness, and how to approach fitness, how to think about fitness. Instead of thinking about it as, "I need to be doing this. I need to be working out this many days a week, and it must be high intensity stuff. And I have to be- if it's not an hour, then it's not worth it," because that's not true. I get people thinking about fitness differently, and then provide a plan for beginners, intermediate, and advanced athletes, and teach them- write up a whole program, I have tons of workouts, and just some like step-by-step guidelines for how to perform the movements, because that's really important to me too. So it's got it all. Noelle Tarr: It is hard. The first is- my very favorite recipe is called Thai Coconut Curry Shrimp, and it's a curry made with coconut milk, and it is so easy, but it's beautiful and it's so like nutrient dense and nourishing and I still make that all the time. The other favorite one of mine that a lot of people have loved are these- it's called Almond Shortbread Cookies, and it's actually just made with almond meal, and like either you could do ghee, but if you don't do well with ghee you can do coconut oil. So it's really just almond meal and- well, almond flour and ghee. And they cook up really quick, everybody's been loving those. And then I tried to make- you have kids, and I have kids, and I know how important it is, how nut allergies have become a really big deal, so I did work really hard to try to diversify a lot of the recipes, and I had to cook this pumpkin muffin breakfast recipe probably like twelve times because it's made with no nut flour, no nuts at all, and only coconut flour, and coconut flour can be really difficult to deal with. Shawn Stevenson: These pumpkin muffins here? Shawn Stevenson: That I've had the book on this page like the whole time? Yeah. Noelle Tarr: Yeah, that's my other fave, mostly because so much time went into that, but it is completely nut-free, so yeah. Shawn Stevenson: The pumpkin- that was because of the beginning of this episode, and I talked about a pumpkin carriage from Cinderella right there. Like I picked you up in the field, alright? Noelle Tarr: Yeah, there you go. Shawn Stevenson: And you've got the ratatouille in here, slow cooker bison chili. Now here's the thing, and what's so great about what you do, and so many other folks that are kind of really on the leading edge of this nutrition movement, is we're upgrading things. We're doing- we're still getting these same flavors and enjoyment in certain foods and the experience, we're just upgrading the ingredients. Like you said, there's a cookie recipe where we're using almond flour, so we're going to not get that big glycemic hit necessarily, and they can still taste delicious. You've got watermelon lime gummies in here, and the gummies got a little mold, so they look like little Lego men. My son is going to love this. Noelle Tarr: Yeah, and it's gelatin. Shawn Stevenson: And same thing, you've got the pancakes in there, you've got- as you mentioned, you've got the pumpkin muffins, so many great things. And the pictures are beautiful, and the recipes are pretty simple. You know, some recipe books just like- they go ham with the ingredients and the process. I think you guys did a really, really great job, so thank you. Shawn Stevenson: Well listen, this has just been just powerful, you know? Insight after insight, and I think this is going to help a lot of folks. And I would love if you can let people know, number one, where can they get your book? And also, where can they connect with you online? Noelle Tarr: Alright so hopefully the book is everywhere that books are sold. Most local book retailers have them, Barnes and Noble, you can definitely get it on Amazon, which tends to be people's thing nowadays. If Thrive Market sold books, I would tell you to go there, and I would probably buy all my books from there, but right now it's Amazon. And I can be found at www.CoconutsAndKettlebells.com. Everything is there, and then the podcast is The Well-Fed Women Podcast. Shawn Stevenson: Perfect. Perfect. Alright, final question. What is the model that you're here to set with the way that you live your life personally? What's the model that you are setting for other people with how you live your life? Noelle Tarr: The model. I think that the model that I set is probably just doing what works for me. I know that's really simple, but everything that I have done in the past few years has been about remaining flexible, remaining judgment-free, and continuing to shift and do things that work for me. And if that means not being so focused on the last five pounds of baby weight, and really focusing on feeling really well, and making sure that I have energy to be a mom and run a business, then that's what I do and I own it. And so I live exactly what I preach. That's what I try to do, and I try to remain flexible, and judgment-free with myself, and judgment-free with the people that I work with. And that's kind of what I want our industry to turn into, is just let's recognize that people can pursue health in a way that you're not pursuing and still be healthy, and it's still okay. Shawn Stevenson: Awesome. It definitely is. So, so good. Noelle, thank you so much for joining us today. I appreciate it immensely. Noelle Tarr: Thank you. Thanks for having me. So many big takeaways. I really enjoyed this conversation myself, and one of the big things that she said that's still sticking with me is that health is not a destination. Right? This is one of the things that we tend to think, and the same thing with just success in life period, or relationships. Like once I get this, I've made it. I've arrived. And life just simply does not work like that. You know? Health is not a destination, it's a process, and in that process is really where the joy is found. You know? Once you get there, I promise you, there are so many people- I'm talking so many people, they hit that goal weight, they finally get that four-pack, or six-pack or whatever it is, and they find out that that doesn't make them any more happy, or that doesn't make them any better of a person. That doesn't necessarily make them more valuable. It's not about that, it's the process of becoming more you. That's where the joy is really found. You know? So ultimately if we can start to fall in love with the process of becoming, because there's always another level, but we want to do this with ease, and with grace, and with intelligence. We have this concept of like, you know, working hard is going to get us to the destination. You know? Hard work is what it takes. For sure, if you're going to achieve anything that's truly exceptional in the framework of humanity, there's going to be some hard work involved, but it's not going to be all hard work. And you can run yourself right into problems, you know? If you're not using your greater faculties, you know? So get a plan, execute the plan, but enjoy the process and give yourself permission to listen to your inner intelligence, you know? If something's not working, give yourself permission to stop, to pivot, to try something else. Because it's the process that's really going to give us the greatest rewards. I appreciate you so much. If you got a lot of value out of this, make sure to share this out with your friends and family on social media. You could tag me, I'm @ShawnModel on Instagram, Facebook, Twitter, all that good stuff. And listen, sharing is caring, you know? So if there's something here that really sparked and hit your heart today, that can do the same for somebody else that you care about. Alright? So make sure to share the show, connect with Stefani and Noelle, and pick up this book. I think you're going to love it. And I'm going to make sure- we're going to have something from this tonight, alright? So don't meet me there, beat me there. Alright? Get yourself a copy of 'Coconuts and Kettlebells,' and stay tuned. We've got some incredible guests and show topics coming up that's going to blow your mind. Alright, so be ready. Take care, have an amazing day, and I'll talk with you soon. Thank you for this podcast! I absolutely love your show and listen regularly. However, in the past I have wanted to ask you why the strict no-or-low carb diet? I am a family nurse practitioner passionate about diet, health, and exercise. It breaks my heart people are so afraid of fruit and healthy quality carbs. I agree with Noell that the quality is what is imperative. In fact, if you search through pubmed there are multiple studies that show that high fruit diets have wonderful health. Enefits including weight loss, reduced A1C and even reversal of T2DM. I myself have eaten a high fruit diet for almost seven years now and enjoy Not only a healthy lab profile but a beautiful body at 36. I wonder where does the myth come from that healthy quality carbs, high fruit diets are bad, I have not been able to find that info on pubmed.